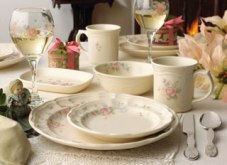 Coordinating dinnerware serveware is a "must" if you want your table setting to beautiful and practical. Tableware products and glassware also play into the mix. Useful kitchen items are great too for coordinated kitchens. Some dinnerware sets have matching serveware and kitchen accessories for the particular pattern available if you want to go that route, but you can coordinate other dishes and serving utensils with your dinnerware to make awesome looking table settings. Dinnerware sets with matching kitchen accessories, serving dishes, flatware and glassware are very nice, but from time to time you might find that the pattern being present on everything can be overbearing. Sometimes it's best to use coordinating dishes to complement the décor of a kitchen or dining room, or to use as serveware in table setting. Tableware products and glassware also play a part, especially for dinner parties and for special occasions.. Solid colored dishes are often good for complementing décor and making tableware look wonderful. In a décor theme that is concentrated on a color, patterned dinnerware serveware might look great, even if it isn't the same pattern as the dinnerware. There are many selections to choose from when it comes to kitchen décor, tableware accessories, glassware and serving dishes. Some of them make great gifts as well. Here are some topics that will give you some ideas for harmonizing your dinnerware, tableware, serveware, and kitchen accessories, or for gift giving. These are a few great accessories that can become part of the décor as well as making entertaining an enjoyable pastime. They make wonderful gifts for birthdays, home warming parties, weddings, anniversaries, and for holidays. They help to put the "special" in special occasions. I have had dinnerware sets with matching serveware, tableware, glassware, flatware, and kitchen accessories such as a cutting board, salt and pepper shakers, a napkin holder, kitchen canister sets, towel and potholder sets… even the stove burner covers, rugs, and curtains featured the pattern. It created a unique looking kitchen, but since then I have developed a liking to coordinating décor. My dinnerware was the Applejack pattern which features apples and plaid in red, green and black. 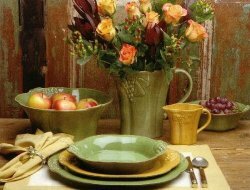 Solid colored green, black or red serveware, tableware and kitchen accessories would have looked great with it.